This is a favorite short hike of the Saddlebrooke Hiking Club. Access is from the east end of Golder Ranch Road in Catalina. This is the trailhead for a number of hikes and mountain bike rides. 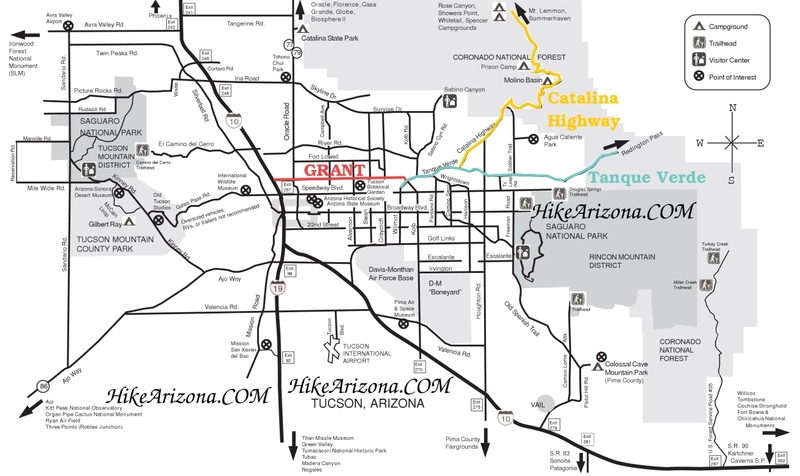 The 50 Year trail from Catalina State Park comes through too. Hike down the road a ways past the gate, then follow a trail to the left. Do not take the road to the end. That will take you to the Baby Jesus trail. Follow the trail across a couple of washes and then gradually start to climb. It is important to follow the GPS track as there are a lot of mountain bike trails around here and a lot of trail intersections. You will cross several small washes and hike up a wash for 100 yards. After about 3 miles the canyon will come into view. At about 3.6 miles you'll pass through the heart of the canyon. At 3.8 miles there is a great rock outcropping to stop and have a snack or lunch. The trail will continue on to meet up with Charleaux Gap Road. From Oracle Road (AZ-77) north of Tucson in the community of Catalina turn east on Golder Ranch Road. Follow road until it crosses cattle guard. Immediately after cattle guard turn left. You are now on gravel road. Less than 1/2 mile later the road splits. Take the right split. After here, depending upon the year and rain washouts, you may need a high clearance vehicle. We did it with a regular car. About 1/2 to 3/4 mile later you will come to a parking area. After the parking area the road gets extremely rough. Only very high clearance and 4x4 can continue.